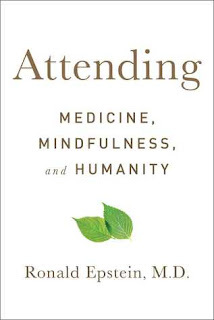 Crystal Book Reviews: Attending: Medicine, Mindfulness and Humanity by Ronald Epstein, M.D. Attending: Medicine, Mindfulness and Humanity. Ronald Epstein, M.D. Scribner. January 2017. 304 pp. ISBN #: 9781501121715. What is medical practice like when a physician takes the time to tune into the patient, to find out what is going on in mind, body and spirit? Does a different diagnosis emerge from such sensitivity? Does the physician experience less stress in a system that is fraught with demands for quality performance at the least possible cost? Is this type of change necessary when physicians are so trained to churn out diagnoses from lists of diagnostic symptoms and formulas for treatment? Dr. Ronald Epstein attempts to answer these and other questions. His central thesis is that doctors who practice mindfulness as part of their practice are less stressed, more effective and more human, like their patients. Dr. Epstein describes his experience as a third-year Harvard Medical School student as he watched a surgeon operating on one kidney totally ignore that the other kidney was turning purple and looking engorged with blood. While that other kidney was within the surgeon’s field of vision, it had no primary concern or focus. The field was narrow but the surgeon’s focus was narrower. It may not seem like a big deal but it could have had fatal consequences. Perhaps you’ve heard a patient cite symptoms, feelings and questions in one long speech upon first entering a doctor’s office. How does the doctor handle that barrage and how many items can the physician handle? What can be ignored out of that list and should it be ignored? Dr. Epstein handles this answer without condemning doctor or patient and instead focusing on techniques of mindfulness that mean a doctor is more sensitive to everything coming into his medical surround. Mindfulness is enhanced with compassion and a state of constant curiosity on the part of the physician. 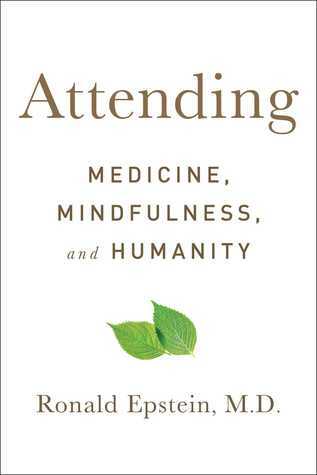 Numerous medical anecdotes fill the pages as we learn about some of the components of mindfulness. The stories keep it all interesting as there is a bit much of repetition – perhaps a necessary mode as some may be tempted to pass over these elements of “how” to learn mindfulness and practice the same with patients. All in all, this is an interesting text for those who are teachers, students, practitioners, or administrators in medicine. Certainly, Dr. Epstein presents a model of medicine that will fascinate both practitioners and patients. Nicely done, Dr. Ronald Epstein! Labels: Attending - Medicine, inspiration fiction, medical nonfiction, medicine, Mindfulness and Humanity, nonfiction, Ronald Epstein M.D.